Timber! for Minecraft is finally unveiled. 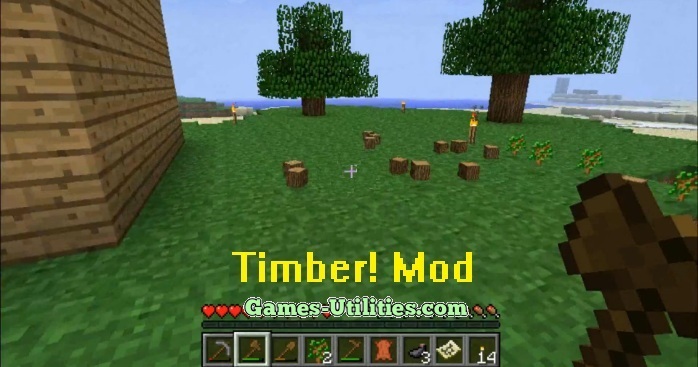 Timber is a mod for Minecraft which lets you collect wood instantly. You just need to chop the bottom log of tree and all the wood will fall off. You can switch this function by setting a desired hotkey. This mod really helps when you are playing on mods such as The Twilight Forest and tropical maps. Description: Minecraft mod for easily farming woods. We hope that you will enjoy playing Timber Mod for Minecraft and be patient because mods will take some time to be edited and release. Have fun playing Minecraft..